About a year ago, I reviewed a pre-published book for a colleague. Yesterday in the mail, I received this HUGE package from her containing copies of the published book, a lovely thank-you note, cat toys and--BIG excitement in the Harris household--a new cat tunnel. That, people, is how to do a "thank you" in style. The book is a delight. 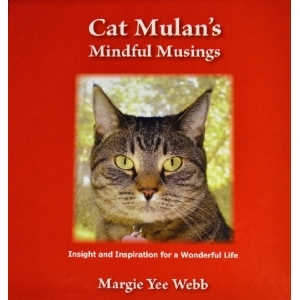 It's a gift book called Cat Mulan's Mindful Musings and the author, Margie Yee Webb, also took all the stunning photographs you'll see in the book. The text is cute and will make you smile but the photos...! They will just make any true cat lover melt. You can't paw through this book and not want this cat for yourself. While I examined the book, Lucy examined the new cat tunnel. I caught a bit on film - Quentin Tarantino I am not. But hey, it's a cat! On YouTube! That means you have to watch it.